The "Dark Ages" and "The Saxons"
The hundred years or so following the withdrawal of the legions saw a gradual collapse of the Romano-British way of life as waves of Saxon invaders took control of the country. These people settled the land and established a number of Kingdoms such as Kent and Mercia. Our area, however was part of Wessex with its capital at Winchester. The Kingdoms were divided into Shires and it appears that Hampshire had become a recognisable entity by the eighth century. The name being taken from Southampton (Hamwic, Hamtun) which began to emerge as a major trading port in the seventh century. 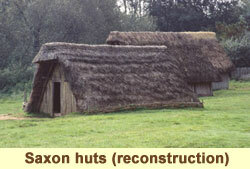 The Saxons were primarily pagan up until the sixth century. 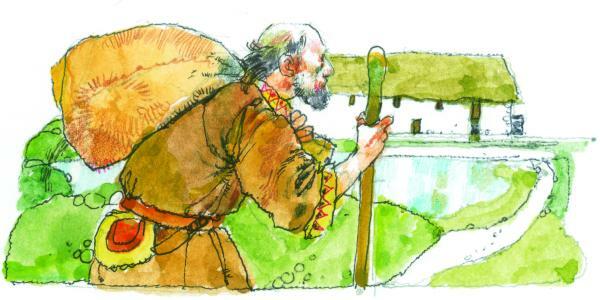 From Gildas we learn that St Columba came from Ireland and founded a monastery on Iona in AD 536 to convert the pagan Saxons of the North and West. Celtic Christianity began to spread. Under orders of Pope Gregory I Christianity was brought back to Britain via Thanet in Kent by St Augustine in AD 597 and the power of the Roman Church began to grow. Christianity eventually became the dominant religion but incorporated many pre-existing pagan practices. The Celtic and Roman branches of Christianity were united by King Oswy at the Synod of Whitby in AD 663 when the Roman Catholic Church became the predominant religious body. The country, including Hampshire and Surrey, was raided by the Vikings in the late eighth and ninth centuries. The Saxon Kingdoms were finally united by Alfred the Great who defeated the Danish army in AD 878 and established the Danelaw - an area of the country under Danish control. Viking raids continued however and the Anglo Saxon Chronicle records a battle near Farnham in AD 894 at which the Vikings were again defeated. Thanks to three generations of the Ellis family history, as there is a reference to the Mill in the Woolmer Forest records of AD978, so it is fitting to say "The Mill has ground her corn, and paid her tax, ever since Domesday Book". More information on Mills in the area can be found HERE at the Headley Village web site. Little else is known about our area in Saxon times as written and archaeological evidence is sparse, though a Saxon cemetery has been found in nearby Alton. However we do know from the Domesday Book that in the mid-tenth century many lands around here were held by Edith the wife of King Edward the Confessor and daughter of the powerful Earl Godwin. 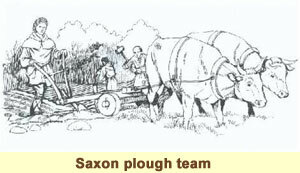 Most of the clues to Saxon occupation come from placenames in the landscape examples include Wulfamere (Woolmer) - wolves' pool, Hogmoor (wild boar or pigs' pool), "Acangre" (Oakhanger) - a sloping wood of oaks and "Alfsiholt" (Alice Holt Forest) named after Aelfsige - a Saxon Bishop of Winchester, Kingsley - the King's clearing (between two Royal Forests - Woolmer and Alice Holt).